Lisa irby is a well know internet entrepreneur she has started her online business career with several failed projects until she was successful with her website 2createasite she has good experience in niche website building as she owns several niche websites along with a successful webmaster forum called websitebabble. But the truth is until you take action there won't be any reaction to earn some real money you need to work hard. If there was some job that doesn't require any hard work then no one would share it with others. 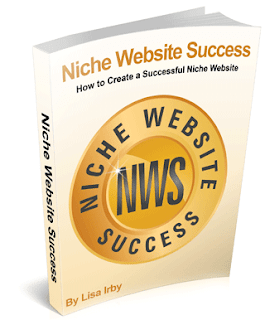 Niche website is all about creating a niche profitable website it has covered everything you should need to build your own niche website empire you just need is time and dedication. How to choose right niche to being with: Every niche is not good money makers so first chapter will help you select the right product to promote. Keyword Research: You will learn tricks to find out what search phases people going to use to find your website. Monetization: You will learn how you can earn money with your visitors of your website. Adsense Earning: Adsense is the biggest ppc program by google you will learn how you can boost yoru adsense income. Video (YouTube) : Youtube is the second favorite place for searching videos this chapter will help you how you can use youtube videos to earn money. eBook Creation: eBook selling is pretty much hot business you will learn how to create an ebook and selling it. Niche website success is great course and highly recommendable for anyone from beginners and to some professionals. It's not a get rich quick scheme neither some auto pilot income program which are mostly scam. You will get genuine training and ideas that work!! Good Luck.